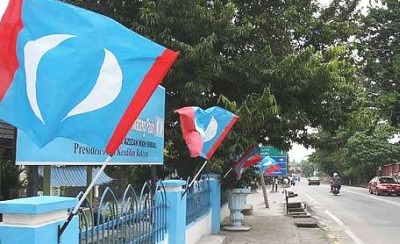 BUKIT MERTAJAM: Banners, flags and billboards have been put up in Permatang Pauh as Barisan Nasional and PKR workers set the campaign tone ahead of the constituency’s by-election. Although the by-election date has yet to be set, party supporters have started wooing voters through banners and billboards. The four-storey white and blue Yayasan Aman building in Kubang Semang has become busy as it will be used by PKR as their operations centre. This entry was posted in Elections, Politics and tagged Anwar Ibrahim, Flags, Permatang Pauh, PKR. Bookmark the permalink.